Funeral doom had a quite inspirational effect for those who were looking for new kind of impulses in musical extremeness. 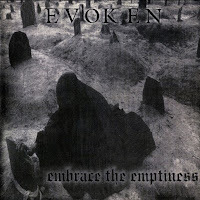 Evoken referred to Thergothon as their main inspiration, the very first pioneer of the style, and soon they became the most popular funeral doom band. Compared to the the earliest bands in this style, Evoken focused on excellent sound quality since the beginning, to reach maximum effectiveness to the strong atmosphere they are operating with. While in Thergothon distorted noises and keyboards with '80s touch were resposible fot the atmosphere, the clear sound gave wider possibilites. Evoken liked to involve lots of melodies too, so their death/doom influences are referring to the audience friendlier style of the subgenre. The returning melodies are not letting their music to slip into the depths of endless monotonize features, so even though the song leghts are decently extented, they don't become boring. Evoken always trying all possibilities how to keep their long mourning ballads intense enough. Since the melodies and the atmosphere having main role, the deep growling vocals are responsible for the heaviness.